The definitive work honoring the 150th anniversary (2011-2015) of the American Civil War, the Encyclopedia of Civil War Battles is an illustrated, unbiased narrative of the clashes defining the unrelenting struggles of two divergent national souls — one for the fierce independence of the South, the other for the preservation of the Union and the abolishment of Slavery by the North. Depicting one of America's most titanic sagas, the Encyclopedia conveys a clear, untainted view of the varied character of the war; its cruelty, mercy, brutality, kindness, nobility, invention, and brilliance. Twenty-five years in the making, with more than 3,000,000 words and 3,000 color and black & white images in 3 volumes, this is by far the most comprehensive work on Civil War battles to date. 3 volumes, approximately 1,000 pages in each volume, more than 3 million words. More than 3,000 color and black & white images, photos, and illustrations, some never before published. Most entries are illustrated by one or more photos or sketches, dozens accompanying major text entries for campaigns and battles. 50-page Color Portfolio in each volume, 200 images in each section (more than 600 color images). Each eBook is extensively cross-referenced with links for fast navigation and and easy searching. All new text and more images than ever published in a single work on the subject, including hundreds of new battle maps for all major battles and campaigns. Every major and minor land and sea battle, engagement and skirmish included in main text and in Supplements. Entries generally range from 1,500 words to more than 50,000 words. Each substantial A-Z narrative text entry preceded by "Background" or "Summary of Battle(s)" section for ready reference. More than 20,000 eyewitness accounts throughout. Bibliography of more than 15,000 entries with full citations — the most comprehensive bibliography ever offered on the Civil War — present in each eBook (and in Volume III of the Deluxe Library Edition), annotated and cross-referenced from text entries. Abbreviated bibliographic citations also follow narrative text entries (often hundreds for major entries). Index of 100,000+ entries, plus a compilation of an additional six thousand minor engagements, operations and skirmishes in Supplements, Vol. III. Includes a Glossary of all military terms used in the Civil War. Includes filmography of all silent and talking films about the Civil War —illustrated with scenes from the movies in Supplements, Vol. III (linked to actual battles). Twenty-five years of painstaking labor have gone into this amazing work. The search and acquisition of more than 10,000 unpublished battle reports (located in city and state archives and in private residences) took more than a decade to accomplish. The research was guided by essential primary sources, especially battle reports written by Confederate and Union commanders from the company level to army command. Reliable, first-hand eyewitness accounts serve as the core of the research for this work, as well as all relevant memoirs, diaries, letters, autobiographies and governmental reports of the era. These accounts offer new details about every battle, recorded skirmish, operation, and engagement on land and sea. 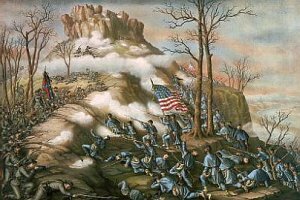 Readers will discover fresh information about certain Civil War battles. For instance, Pulitzer Prize winner Douglas Douthall Freeman states in his classic three-volume work: Lee's Lieutenants that the battle of Big Bethel, Va. (June 10, 1861, the first land battle of the war) "...had been a small battle to be sure. 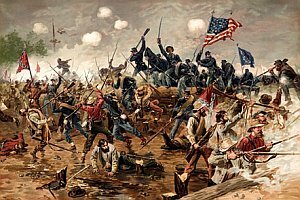 Not more than 300 of the 1,400 Confederates had been engaged simultaneously and then for no longer than twenty minutes." However, the acquisition of the complete battle report of D. H. Hill, the Confederate field commander at Big Bethel, details a battle which lasted for many hours, not twenty minutes — resulting in hundreds of casualties on both sides. Riveting narratives dramatically depict the action minute-by-minute, hour-by-hour, through revealing descriptions provided by the participants. The text details strategy and tactics employed by the commanders as each action unfolds, meshing the order of battle with the personalized, vivid experiences of the soldiers on both sides. It is a rich, moving story, conveyed in informative, revealing, ironic, poignant, religious, humorous and horrific anecdote. Unequalled in scope and depth, unparalleled in research and scholarship, the narrative of this work encompasses the lofty strategies and hardscrabble tactics of the commanders of this war. It also realistically depicts, in human and passionate terms, the lot of the lowly foot soldier, whose perspective can be seen through more than 20,000 eyewitness reports. Appearing in its entirety prefacing the main text of each of the three volumes, the Table of Contents for the Encyclopedia of Civil War Battles is detailed and comprehensive. Entries by volume: Volume I: Alabama to Frying Pan, Va.; Volume II: Gaines Mill, Va. to Rowanty Creek, Ga.; Volume III: Sabine Pass, Tex. to Yorktown, Va., plus all Supplements, including a compilation of Minor Engagements, Operations and Skirmishes by location; Filmography; Glossary, Bibliography (appears in each eBook and in Volume III of the Deluxe Library Edition), Index. Offered incrementally as each volume is completed. Both eBook and Deluxe Library Editions will be offtered (acid-free stock; end-sheets; Smythe-sewn binding; high-grade vellum cloth). The author is presently completing two additional three-volume works: the Biographical Encyclopedia of the Confederacy and the Biographical Encyclopedia of the Union. Each set contains more than 3 million words, over 3,000 images, and greater than 3,000 pages. Release of the full 9-volume set is anticipated to coincide with the 150th anniversary of the start of the American Civil War (2011). Jay Robert Nash is the only author to receive four Best Reference awards from the American Library Association. He has produced more than 70 books and multi-volume reference works, including the 17-volume Motion Picture Guide and the 8-volume Encyclopedia of World Crime which have become the definitive reference works in their fields. He has also been the recipient of the Edgar Allan Poe Award and has been nominated four times for a Pulitzer Prize.